DUMBARTON put on a spirited performance in a match at the Falkirk Stadium televised by BBC Alba, and were unlucky not to pocket a share of the points. DUMBARTON put on a spirited performance in a match at the Falkirk Stadium televised by BBC Alba but largely ignored by the national press, and were unlucky not to pocket a share of the points. The problem for Stevie Aitken's men was the first 20 minutes while their new look defence, bolstered by the arrival of veteran Frazer Wright from Inverness Caledonian Thistle, took time to settle down — and lost two early goals. 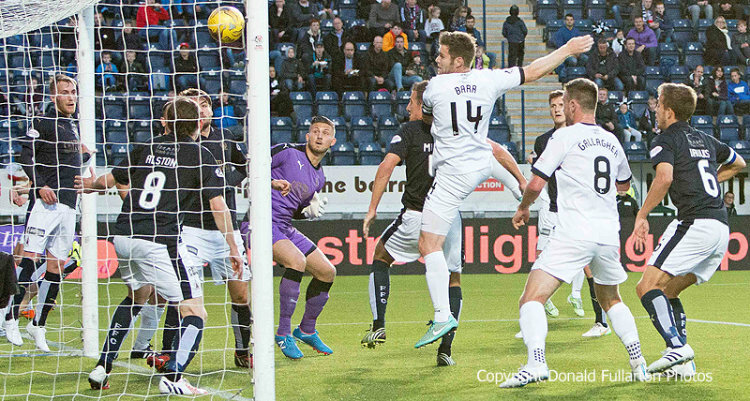 Bairns fans expected their team to add to that total, but it was Sons who dominated the match after former Falkirk player Darren Barr, now Sons skipper, headed home from close range (pictured). They had the better of possession and opportunities, but could not find the net. The best chance came shortly before the end when a cross reached Grant Gallagher at the far post, but he could not control his close range header with the net gaping. Astonishingly the Daily Record and the Daily Mail did not carry a match report, while the Herald only reported the first 20 minutes.